The closed low pressure area that brought showers and thunderstorms to parts of Northern California over the weekend is now over Southern California and is moving slowly eastward. Today there will be afternoon and evening thunderstorms over the Sierras from Mt. Lassen southward. The rest of the north state will be mostly sunny with near normal temperatures and light north winds. Tuesday and Wednesday there will continue to be afternoon and evening thunderstorms over the mountains of the north state with mostly sunny skies elsewhere. Temperatures will be normal to a few degrees above. Thursday the next closed low will be forming off the coast. 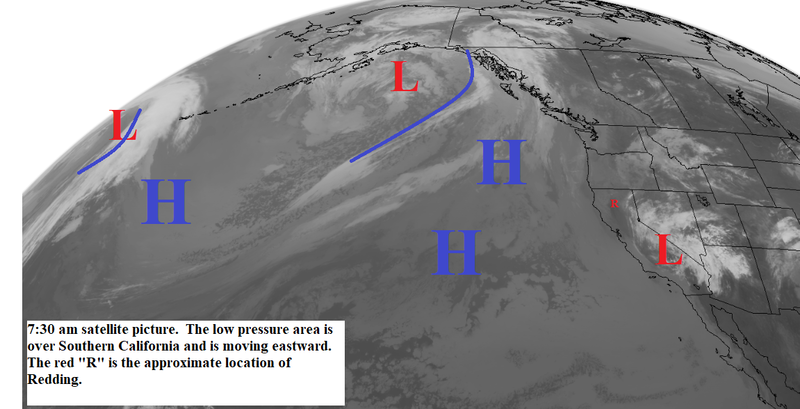 This system will move across Northern California Thursday evening and Friday (see map below). During this time we will see increased showers and thunderstorms with some activity possible in the valley. Temperatures will be a few degrees below normal. Saturday the low will be east of our area. There will still be afternoon and evening thunderstorms over the mountains north and east of the valley with partly mostly sunny skies elsewhere. Sunday and early next week look mostly clear with near normal temperatures.